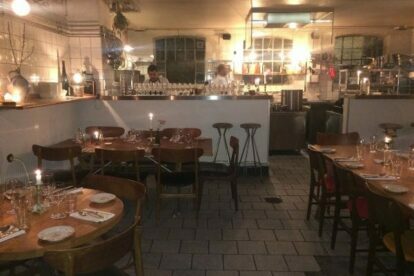 Spisehuset is one of the most well hidden restaurants I can think of in Copenhagen. Walk by the famous meatpacking district towards Central Station and you’ll pass the drug addicts fixing rooms (not to scare anyone away, it’s perfectly safe). Here you’ll see a lot of former slaughterhouses, row after row. In between some of those old charming buildings lies a restaurant that’s all about organic food and natural wines. Just how I like it! The menus are often changed due to the seasonal foods. Everyday it’s a fixed menu inspired by the fresh vegetables and meat they get from local farms. Plates and cutlery change from table to table and the walls are covered with raw tiles. I just love the whole concept! Especially that the kitchen is fully open, so you can see the food being created and it really feels like that you as a guest are a part of the whole circus. It all has a raw and authentic presence to it. The place is brilliant for a glass of wine at the bar and maybe a small snack, or you can go for the big menu with a bunch of good friends. I recommend going all in! If you love tasty, natural products like I do, and if you’re into the whole rustic food experience in the middle of the city, then I’ll bet this restaurant would be a perfect choice. As I write this, I realize that I don’t come here enough at all!